As always I apologize for misspellings. It's not easy to transcribe handwritten notes. Virginia Wilson was the grandaughter of Flora Wilson, who was at one time the post mistress in Hood River. Dorothy Applegren was the daughter of John Duckwall and Minnie Paasch. Her father was head of Duckwall fruit company. She was a half sister of Fred Duckwall. I am thinking that this might be Asbury Methodist Church. Wilma Sherwood was a beautician in Hood River and married to Leslie Sherwood. Zadah Ebi was a music teacher. Her husband was the baggage man at the depot. Dorothy Bostwich's maiden name was Howe and she was married to Lyle Bostwich. Anna Calmettes was married to Ray Calmettes and they had the green houses and florist shop on The Heights. I believe this was taken at Asbury Methodist Church. Makes me glad I can't sing. Is that a pipe organ in the background? I took piano lessons from Zadah Ebi in the 1950's. Yes there was a pipe organ at Asbury. 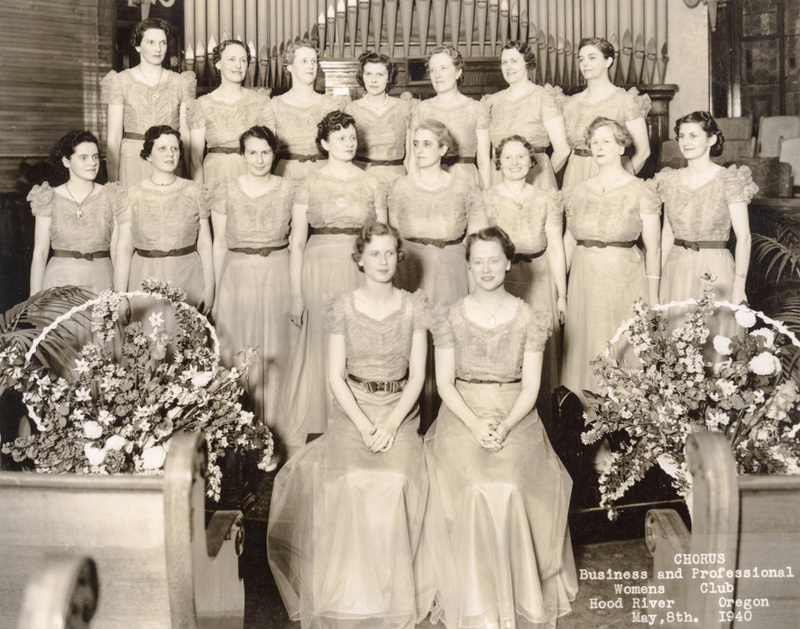 What happened with the pipe organ when they sold the church building? I was wondering that myself. I don't know if the organ is still there. Isn't that like a play school now? Would they have use for a pipe organ. I know there was one at Asbury, as that is where my brother was married and all the wedding photos have it in them. The organ was still there a year ago. My first thought was that this was Asbury Methodist Church. Arlen, did you pick up on that? We spent a lot of hours there; maybe it helped. Our Mother was probably the organist at that time. Does anyone else remember the old pump organ in the side room?